If you're a regular around here, a friend or family member of ours, or have a vague sense of who I am, you know that I love wine. Hmm, love might not be a strong enough word. Maybe LOVE is better. We've expressed this affinity towards wine (and the Napa Valley wine country) through a series of posts. Well, we're back at it, but this time we're doing it in the name of the Pinterest Challenge. If you're not familiar, the Pinterest Challenge is being hosted by Sherri & John at Young House Love, Katie at BowerPower, Erin at Hi Sugarplum, and Cassie at the Great Indoors. The goal is simple -- take something you've pinned that you find inspirational, do your own version, and put your own spin on it. Easy enough, right? Well, have you see how many cool and inspirational things there are on Pinterest? Just picking one thing to make might actually be the hardest thing about the challenge. Over the past few months I've been pinning things with a wine bar/wine country feel to it on a pin board called "Cheers". 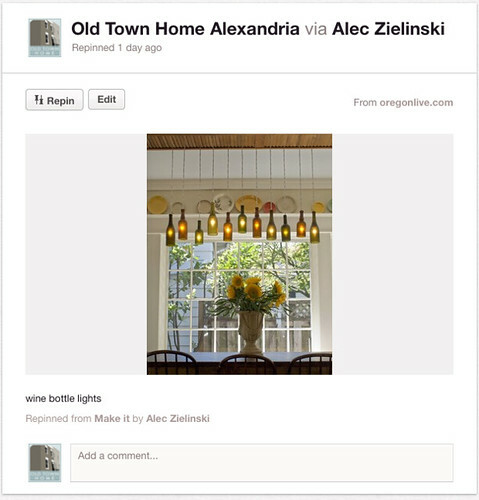 (If you're not already following us on Pinterest, what are you waiting for? We have a ton of cool stuff we've shared.) It's my dream to have a functional and cool wine bar to entertain people and share a little wine with some friends. During my Pinterest perusing, one of the things that repeatedly caught my eye was the creative use of empty wine bottles. In my opinion, wine bottles are quite elegant as far as containers go. Their shape, color, size, and look evoke memories of vacations, celebrations, fun times of the past, and good times to come. But after they're spent, I always feel a little bad throwing them in the recycling bin, especially the special bottles whose corks were popped for celebratory reasons. Though I absolutely loved the bottles I saw on Pinterest, and love love love the majority of the things in the Napa Style catalog (and I also love chef Michael Chiarello, but that's a different story), there were two major issues. The following pinned photo is originally from the catalog pages of Napa Style. The first, size. 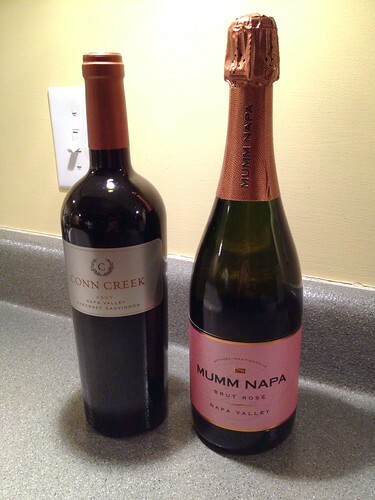 The bottles Napa Style is selling start at the three liter sizes and go all the way up to six liters. Six! Our house is tiny, I can't imagine where a giant bottle like that would even fit without looking ridiculous. 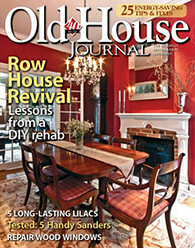 The second issue is price. Starting at $99 and topping out at $249, these bottles, though very pretty, are well outside of my price range for used bottles. Call me crazy, but my preference on price is "free" or perhaps $0.05 cents in Michigan. 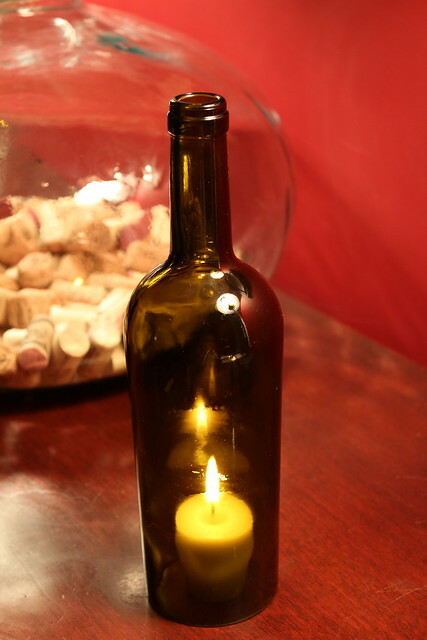 Rather than order large and expensive bottles, we set out to turn a few of our own smaller wine bottles into creative candle holders that could adorn our future wine bar or our outside entertaining area. We started our project with two bottles, one standard 750ml wine bottle and one 750ml sparkling wine (champagne style) bottle. The goal was simple -- cut the bottom of the bottle off without shattering it into pieces and maiming ourselves. Though the bottles were full, we took it upon ourselves to drink them...in the name and spirit of the Pinterest Challenge. We had seen methods to cut bottles that included everything from scoring the bottles with a glass cutter to heating them with a blow torch and dipping them into a cold bucket of water, but all seemed less than exact and a little dangerous. For our project we decided to give the good ole wet saw a try. We did quite a bit of looking online but couldn't find definitive proof that a wet saw would do the job we wanted it to, so we figured we should figure it for ourselves. 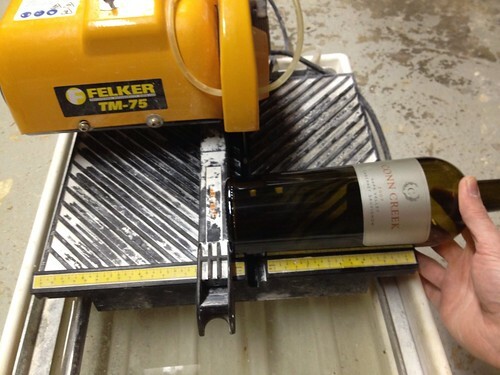 The fist step was to set the fence on the wet saw to give us a good guide to rest the bottom of the bottle on. Our approach was to begin cutting the bottle and then slowly rotate it into the blade. The blade would take a little bit at a time from the bottle until it just dropped off...or at least that was the plan. I love it when a plan comes together. 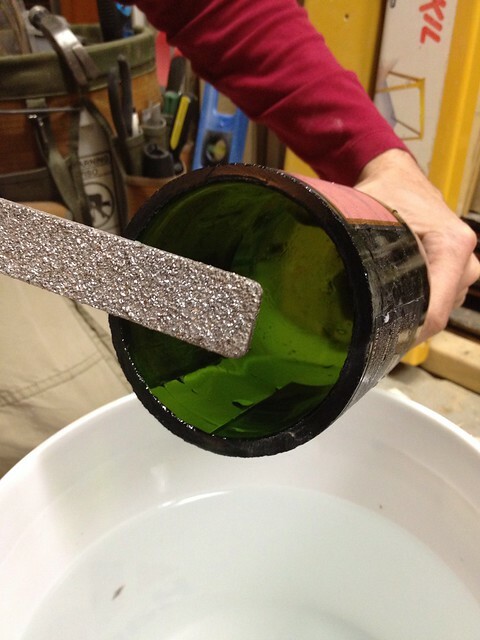 It was a success, and at long last, here's the actual video evidence that it is possible to use a standard wet tile saw to cut a glass wine bottle. I hope it goes without saying, but be sure to wear your eye protection when working with tools like this. 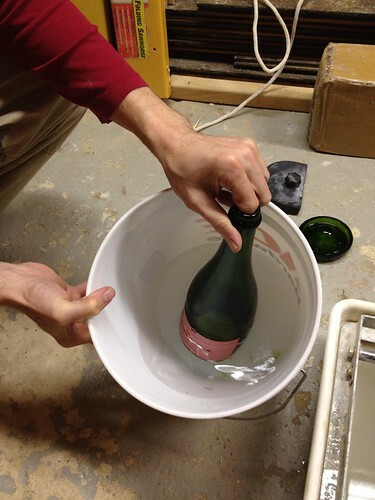 As you can see, you just need to take it slowly, rotate the bottle as evenly as possible, and you can easily remove the bottom from a wine bottle. 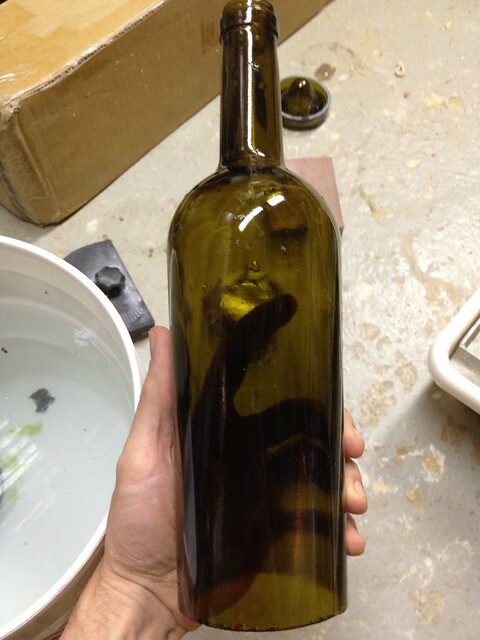 Once the bottom is cut free, there's going to be a good amount of glass residue still inside the bottle. Using a bucket of water, simply rinse out the inside of the bottle so you don't end up getting any glass pieces on your hands. Because of the shape of the bottle there was a small bit of a glass bump left on the cut line. We used a tile file to shave it down a bit and were left with a nice and smooth cut line that wasn't sharp or dangerous. 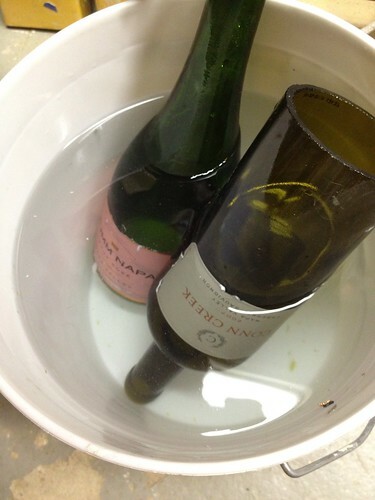 Next we let the bottles soak in the bucket of water in order to loosen the labels. After a quick wash and thorough dry, we were in business. With our bottles ready, we set them on our dining room buffet with small candles. We breathed a sigh of relief, figuring that the hard part was over and now all we had to do is set the bottles over the candles. Wait a second, not so fast. 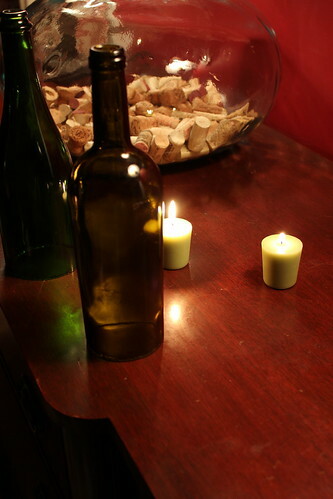 After lighting the candles and putting the bottles over them we hit our first small speed bump with the project. To this point we've only seen this type of thing with much larger format bottles, like the 3+ liter bottles. It seems the necks on the large format bottles are large enough to let the heat of the flames out while allowing fresh air in for the flame (remember, fire needs oxygen). However, these 750ml bottles have a bit more difficult time letting the candle breathe, causing the flame to go out after about 30 seconds. We solved this by allowing the back of the bottle to sit just off of a coaster it was sitting on, allowing air to circulate. Once this was done the candles stayed lit without issue. I also think this will work well on our slatted outdoor table, or in a garden where the ground the bottle is sitting on is uneven. You don't need much of an air gap at all to make it work. Making a quick and easy base with two pieces of 1/4" thick wood will also solve the problem. It would elevate the bottle enough and allow air in between the two pieces of material. 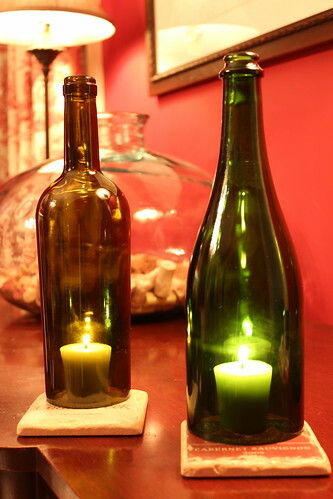 These bottles will also make excellent candle holders outdoors on breezy nights, the flame fully protected from the weather to ensure it won't go out. One final step we took to put our little twist on the project was to personalize the bottles using a Posterpaint Sharpie. Depending on the occasion, you could write a message on the bottles. 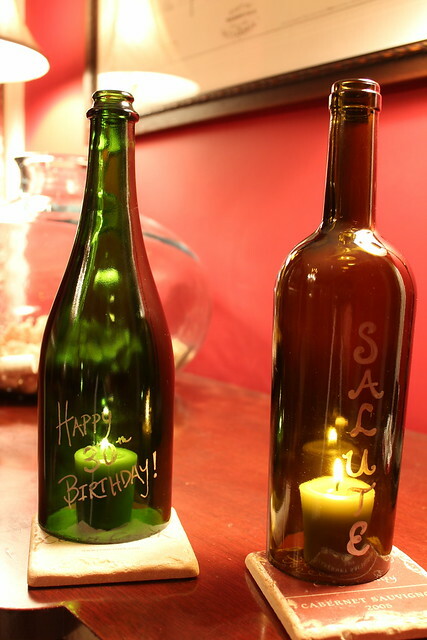 These can be anything from wine inspired greetings to a note about a celebration associated with the given bottle. You can use them to denote what is being served from a table, as seating cards, or just as a way to spice up a gathering. And best of all, you can wipe the messages off and alter them to your heart's content. 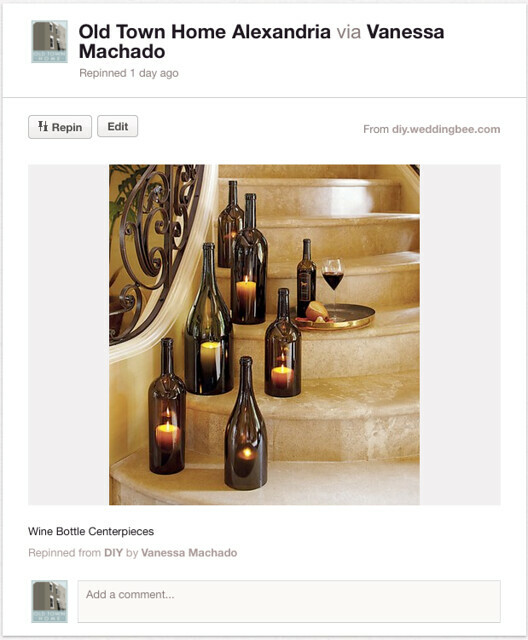 So there you have it, our Pinterest and Napa Style inspired "wine bottle candle holders." Overall, a project that was not too difficult, quite inexpensive (I'll actually go ahead and say "Free" since we already had all items on hand), and one that will work well for a variety of events and settings. I just can't wait until the weather starts to get nice and we can have people over for a wine evening in our garden. Maybe we'll make a large collection of these candle holders in various sizes and colors and decorate our back yard and patio with them. I'm not sure what I like better, the end result or the journey to consume the necessary amount of wine to make the project a reality. And in case you're wondering, the wet saw does a pretty good job of cutting, but it doesn't leave a nice and finished edge (at least not with our blade). So you really couldn't use it to create wine bottle drinking glasses without a bit of grinding and polishing. 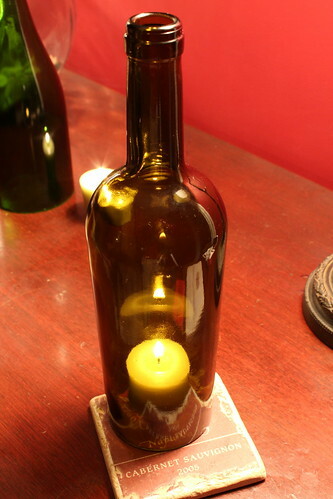 So what do you think of our wine bottle candle holders? Not too shabby of a little project. And best of all, we're reusing something that would otherwise be a recyclable! Are you currently inspired by anything on Pinterest that you absolutely need to try for yourself? Maybe you're even taking part in this very same Pinterest Challenge? Share some of your ideas and likes with us, we'd love to see what you're working on. Could you cut a small hole near the bottom of the bottle, to use as an air hole (aerator)? Possibly. We were talking about doing a small notch in the back using the tile saw. I'm afraid drilling a small hole might have a tendency to crack the bottle. Chateau Morrisette isn't exactly Napa, but it is here in Virginia, just off the Blue Ridge Parkway. I went with some friends on a girl's weekend, and the lunch was one of the best meals I ever had, and the dogs who inspired the label are wandering around and very friendly! It is worth a stop, even if it isn't your favorite wine. It isn't bad, and the tasting is fun. And there are dogs! Hi Karin - Thanks so much for sharing the details. I've never been to Chateau Morrisette personally, but I believe our neighbor gave us a bottle of their wine. Anywhere with friendly dogs is our kind of place. :-) We'll have to check it out! Great suggestion Nikki! The varying height would make a collection of them very interesting. I get the feeling we'll be making more of these as a fun outdoor accessory! And that's so awesome that you live in Edinburgh! It's one of my favorite cities in the world! To echo Karin's comment, Chateau Morrisette is a wonderful winery to visit. Blue Ridge Vineyard has some excellent wines as well and also is in SWVA. Virginia wines have come a long way in the past several years and certainly give Napa a run for their money! Nice. Great idea to use the tile saw. A wooden base (about the size of a coaster) with some shallow, narrow dado grooves cut across it might also allow enough air in to keep the candle burning. Thanks for the suggestion, Melissa! We were also thinking flameless candles could be another alternative if we can't get "real" candles to work. LOVE it! What a great idea. I agree that wine bottles are quite elegant. 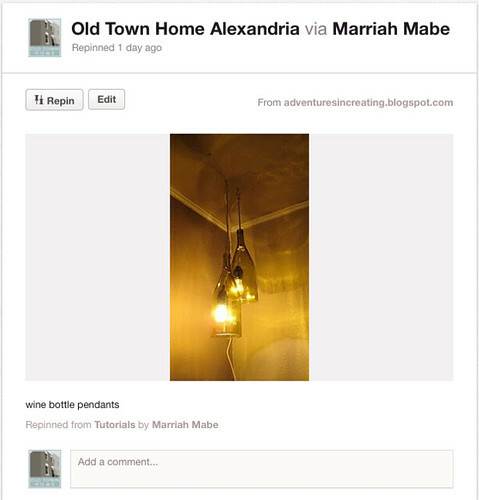 Great job on your Pinterest challenge project!! 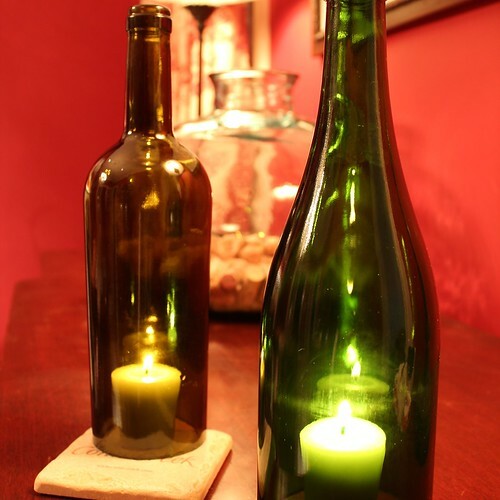 LOVE the wine bottle candle holders. I think the two shapes of the bottles look so nice paired together (& the colors). Just wondering about the coasters?!? LOVE them too! Did you make them or buy them? If you bought them, can I ask where? Thank you very much, glad you enjoyed it. The coasters are actually all from a little tradition/project Wendy and I have. We take frequent trips out to Napa Valley (oldtownhome.com/napa-valley-itinerary/index.aspx) and we like to buy a stone coaster with the vineyard's logo from each new place we visit. Some vineyards don't have them for sale, which bums me out a bit, but we've gotten quite a collection over the years. Each is just a tumbled stone coaster with the logo of the vineyard or label from a specific wine laminated onto the stone. I love getting them out when we have guests come over simply because it reminds me of our trips and the great places we have been fortunate enough to visit. We live near several wineries in Michigan (certainly not comparable to Napa Valley area!) but I don't recall seeing tumbled coasters for sale. 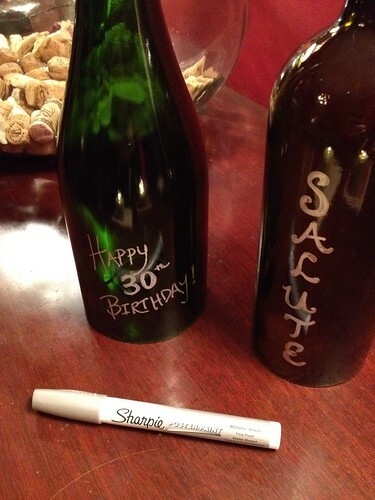 Maybe I'll have to merge a couple of Pinterest finds & make my own with labels from our favorite wines!! Thanks for the idea! ... May I pin one of your pics as a reminder?? Of course Tamar. Pin away! :-) And good luck with your coaster project! Cute! I love wine bottle projects. I did the christmas lights inside for the holidays...and they're still out because they're just too cool to put away. We have a friend who did something similar. It's amazing, white lights can apply easily to almost any season. I like it, especially for a summery party! Great job, and thanks for linking up with the Winter Pinterest Challenge! Erin, thanks so much for hosting. It's an easy project and one that you can complete pretty quickly. And you're right, it will work great in our back yard. This is great! I've been saving wine bottles to try a project too. I love how yours turned out. It did turn out great, we're very happy with them, and we're starting to save bottles now too. Question: This may have been answered already, but here is my question: Must I use a wet saw to cut a wine bottle, or can I use a special blade and a standard table saw? 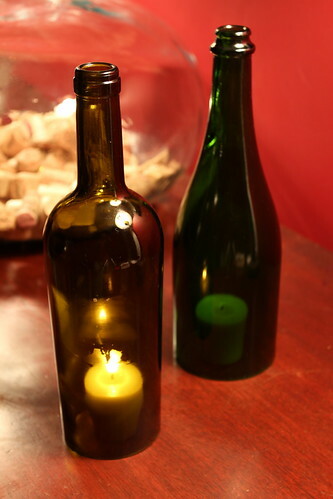 We are using the wine bottles to make centerpieces for a wedding. When we tried the candle it caused the bottle to get VERY hot. Do you typically use real candles? if so, how do you keep the bottle from getting too hot and breaking?